Recently Newport was visited by 2 members of the Kutaisi Rugby Club, the visit was hosted by Newport Rugby Club and saw the club members attend both a local match but also the Wales V Georgia match within the Principality Stadium. Newport Rugby and Kutaisi Rugby Clubs are looking to revive ties among one another. 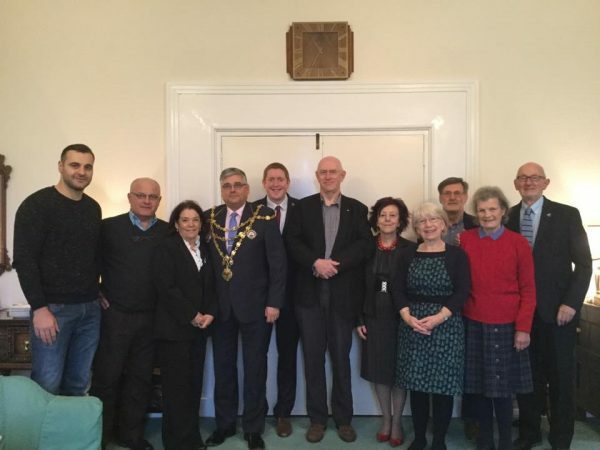 As part of their visit to the city, they met with His Worshipful, The Mayor of Newport (Cllr David Fouweather), hosted by NKTA (Newport Kutaisi Twinning Association) and Newport City Council. Our visitors were kindly welcomed to the Mayor’s parlour for light refreshments and discussion before undertaking a brief tour of the Civic Centre and chance to admire the famous murals. Newport RFC bid farewell to our two Georgian guests from AIA RC Kutaisi this morning, as they set off for home after a week’s stay in the city. Dimitri Pularia (manager of the AIA rugby school) who was also here 19 years ago, and David Nemsadze (AIA’s S&C coach) had time out to visit the Principality Stadium and the Centre of Excellence at the Vale, together with watching Newport RFC defeat Ebbw Vale last Sunday. During their stay they experienced rugby at all levels from the regional game to schools and also witnessed training sessions. The highlight of the trip was at Cardiff last Saturday when Georgia went down narrowly against Wales. David’s brother, Giorgi, was lock forward in the Georgian pack and it was his match jersey that David presented to Newport, Wales and Lions legend, Brian Price last night, on behalf of the club (pictured). The Black and Ambers are famous world-wide and are delighted to make rugby links with AIA RC Kutaisi. It is hoped that Newport RFC will be able to tour Kutaisi in the future.